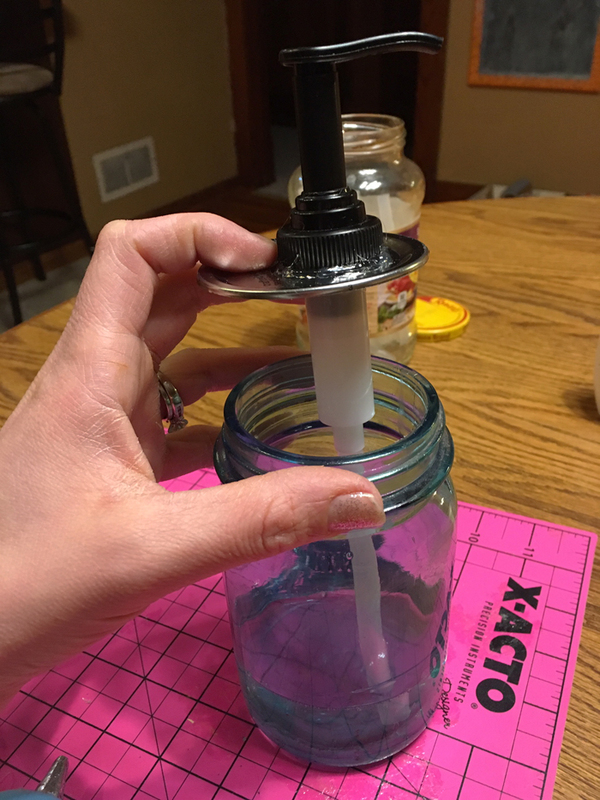 So a couple weeks ago I posted on my Facebook page the image of my finished mason jar soap dispensers. This is something that I wanted to make for a long time, but never had the right power tools to do so. Finally, I decided that I was going to use what I had and make one as best as I could. You might seen something like this going around on Pinterest and have thought I'd like to do that, but don't have the power tools I'd need. Well, I'm here to show you, while it does take some time, you can still make it! But really plan to work for a little bit. Find the movie you can watch without watching, the one you've seen 100's of times, pop it in and start making your soap dispenser! First of all supplies. 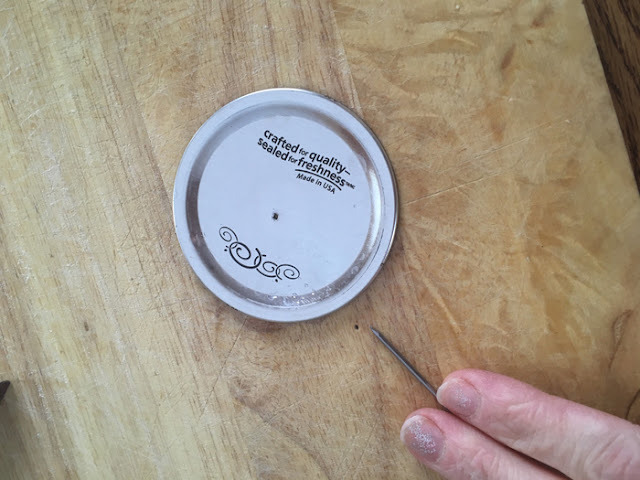 If you look this up online, most sites will say you need a drill with a large drill bit. While I have access to a drill, we don't have a large enough drill bit. So, I will be showing you how to make it using just a simple hammer and nail, along with some other supplies. *for this, I just used an old lotion pump after the lotion was gone. They are easy to cut to the size you need. 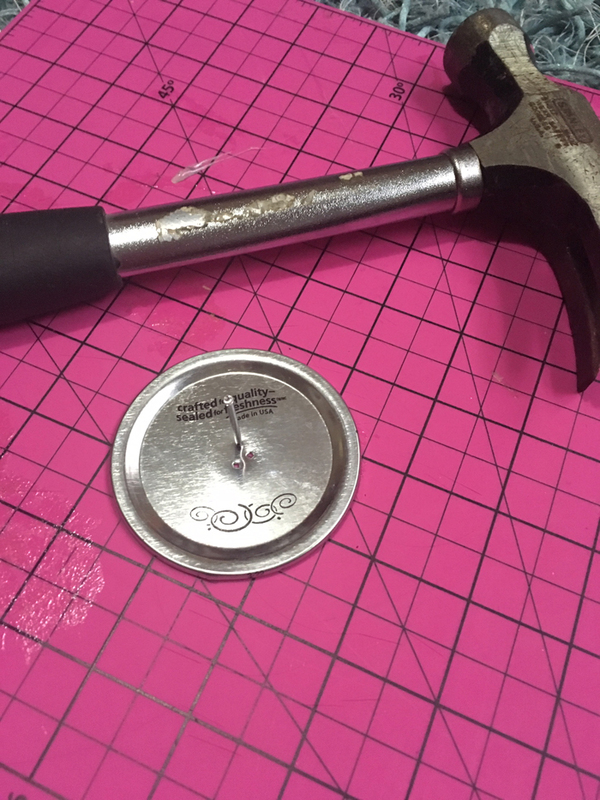 Place nail in as centered as possible and starting hammering a hole into the lid. Hammer a circle around the first hole. Here you have a couple options. 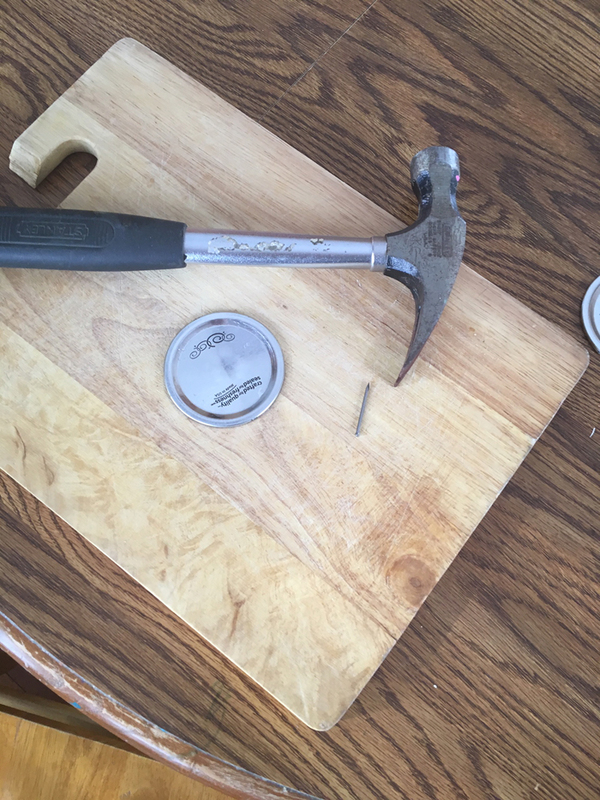 I took a screw and then just hammered it a little. ( I used an old screw that I didn't care if I stripped it & I only hammered it enough to start twisting it). Or, you could use a nail that's a little bigger and nail it in the holes. This is what it looks like after you work and work making each hole a little bigger. They eventually start to overlap and make a bigger space. This is also where your pilers come into play. 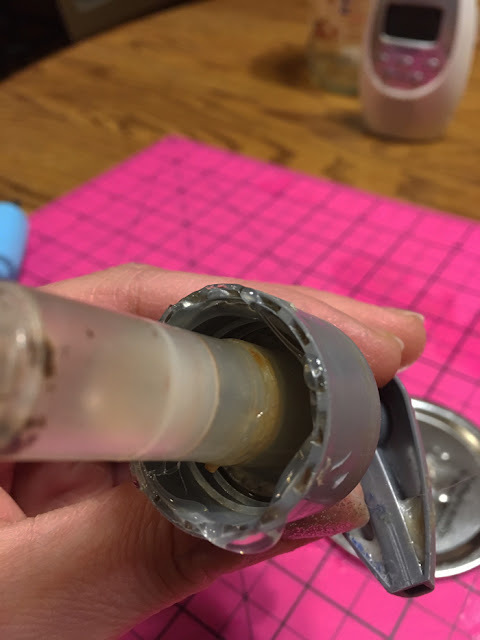 As you make the hole larger, you can start to break some of the spaces with pilers too and pull the metal back carefully. 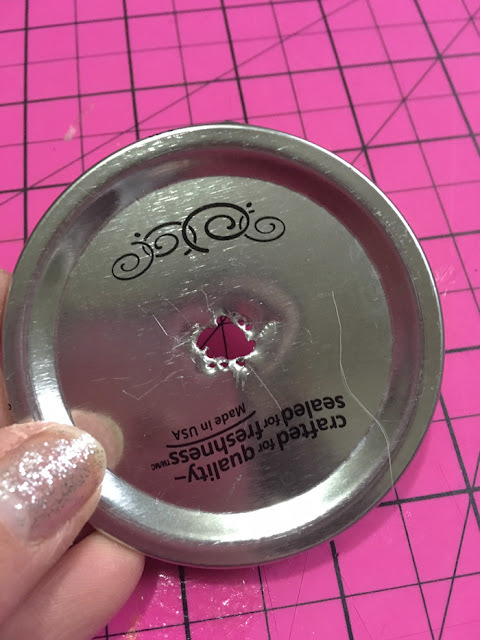 If you don't have a hole, the metal will just rip wherever. Having the holes there to guide it helps. 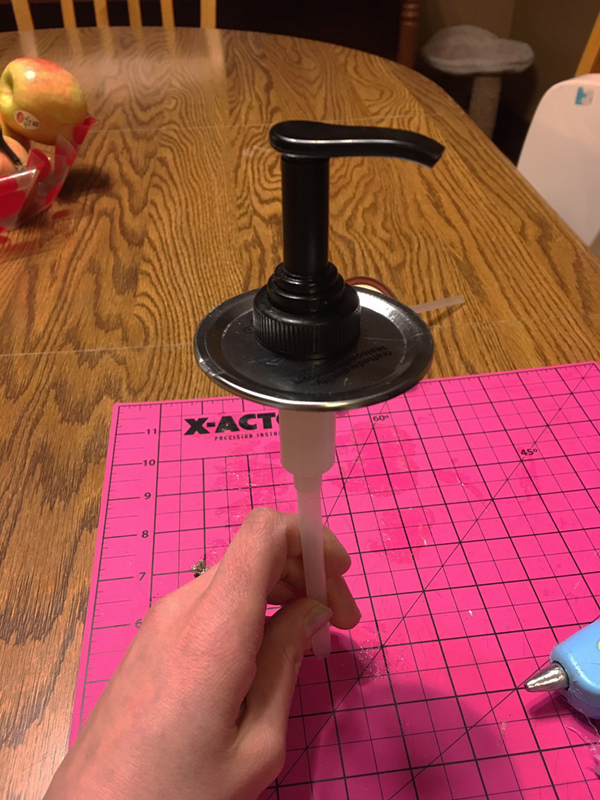 This is a good time to get out the dispenser you want to use and measure. This way you know how much larger you need to make the hole. For this one I was almost there. 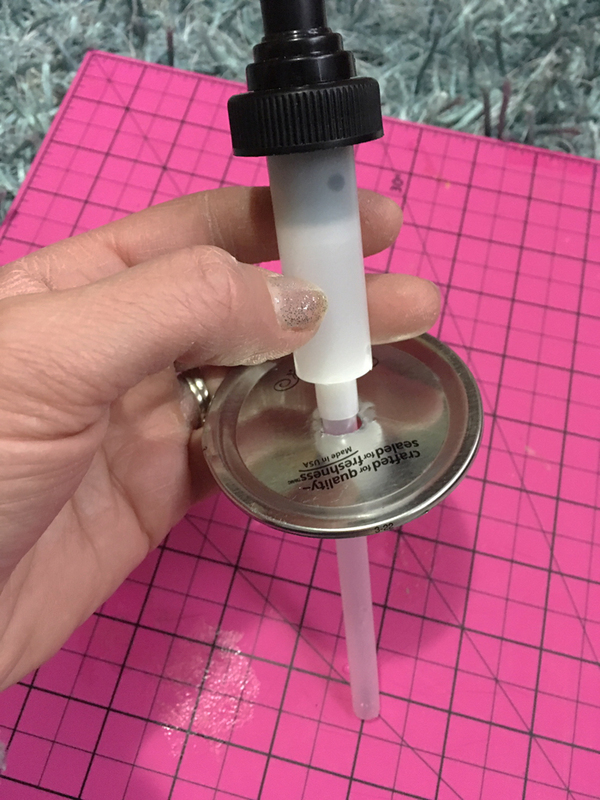 I didn't need to make it much larger to start getting the first part of the pump dispenser in. HOWEVER, when you look at your dispenser the topper part is even a little wider. Now, maybe you're asking why didn't you just make that size to start. 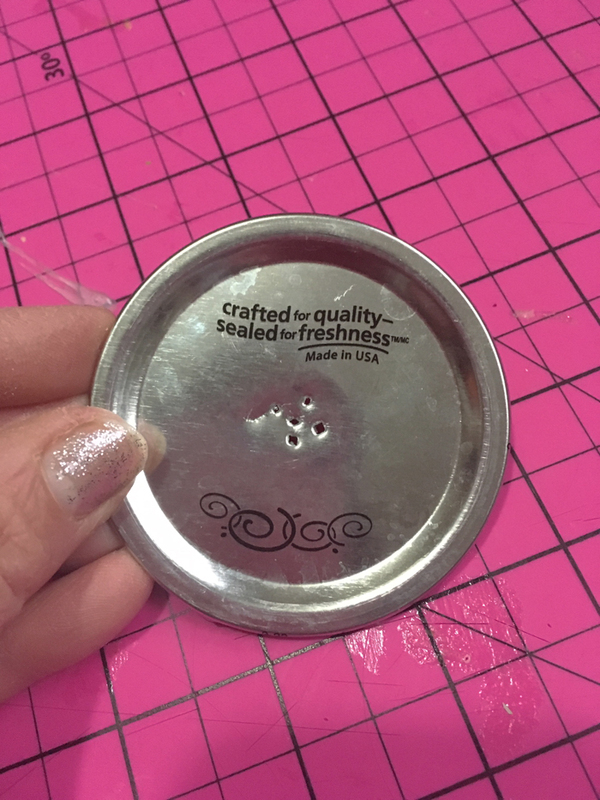 I'm not great at getting the right circle size, so I like to start small and get the first part through then see how much wider to go. BUT, more power to you if you can figure out the exact size right away. 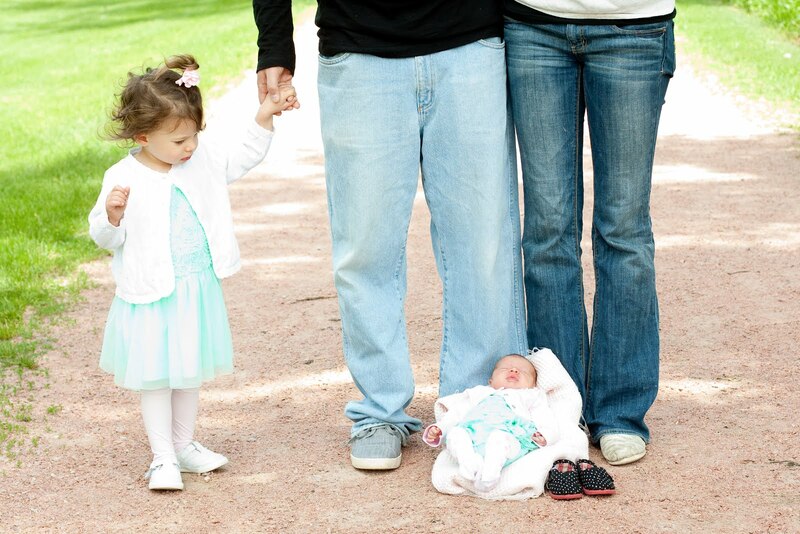 I also am not looking for this to be perfectly centered...that way I have room for edits if need be. 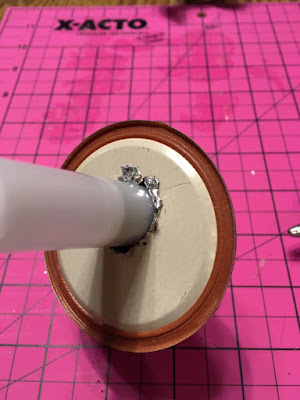 Keep making holes a little larger than the hole you have, use your pilers to pull the metal in places as you slowly make the holes bigger. Remember I said this takes time, but once you get to this stage it starts to go faster. 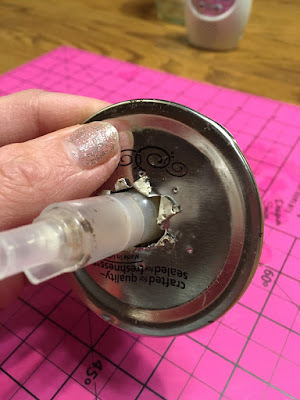 Make sure the dispenser can fit through, if you have some gaps it's ok, you can fill them in with hot glue. These are two different ones I made, the one on the left has some extra gaps, but it still worked in the end, I just added extra hot glue. 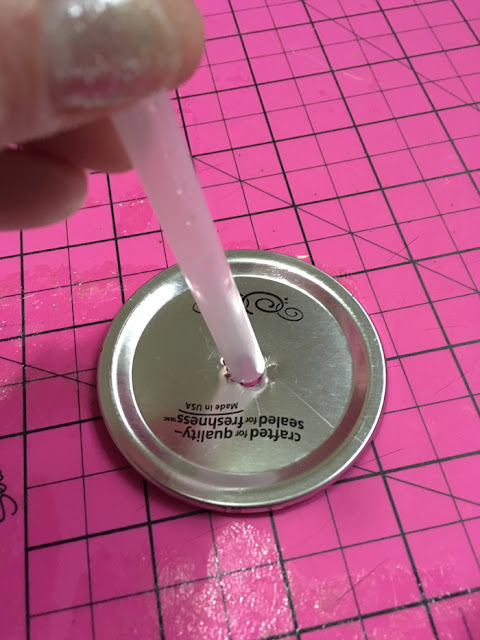 Hot glue the dispenser to the lid. I do this in three parts. First I hot glue the rim of the dispenser to the top of the lid. 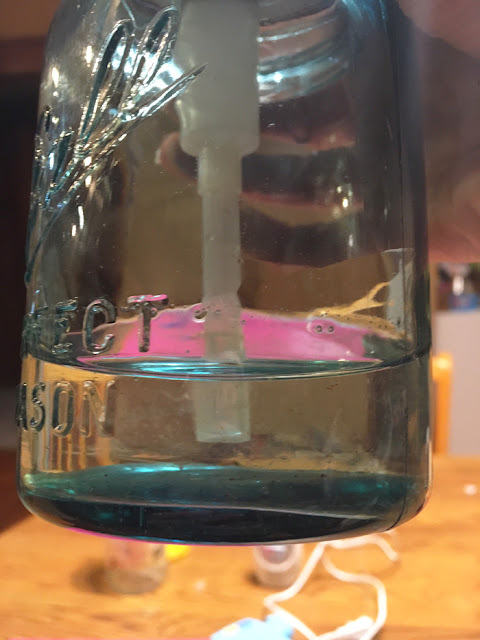 (This step is okay if you miss, I did it for one, but not my other jar. It helps for those that are a little loose). 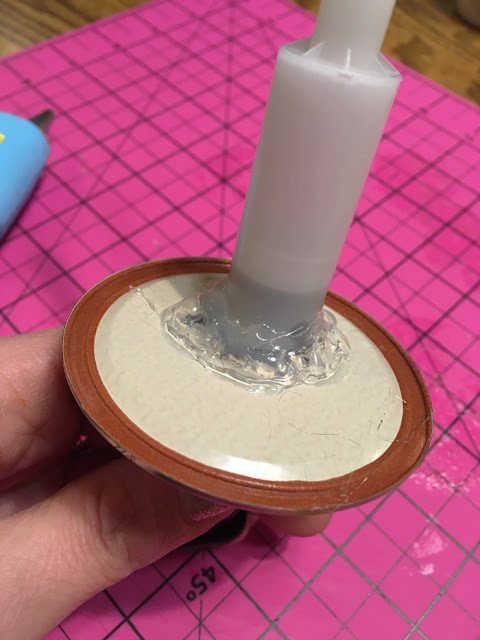 Secondly, I turn the lid and dispenser over and hot glue the inside, making sure to cover up as much holes as possible. I usually go over it a few times here just to make sure it's completely covered. Thirdly, I glue a small amount around the rim on the outside, just to make sure everything is secure. The less holes, the less likely it will rust. Cutting off the extra. Now, take your dispenser you made, and by the way way to go! 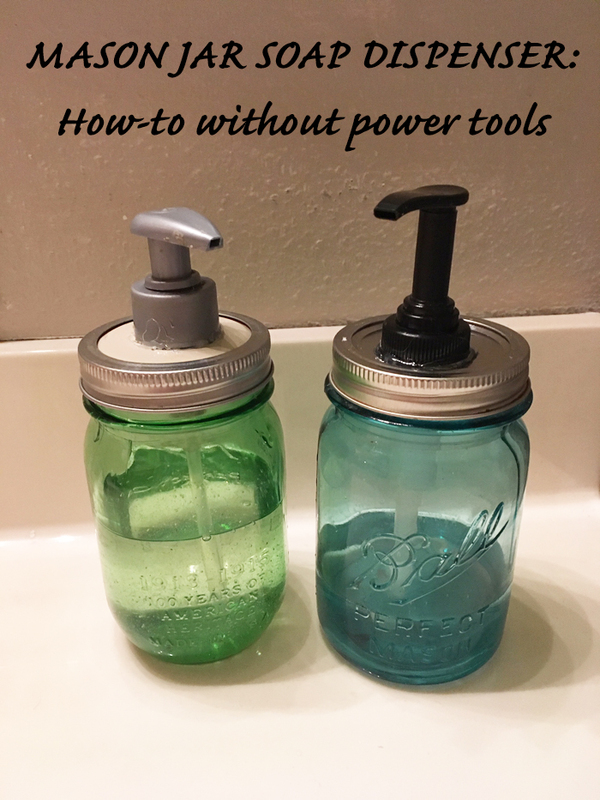 This takes a while without power tools and it's so exciting when you've accomplished it! Also, no worries if it didn't work, take some time walk away and try again another day. All you're out is mason jar lid...the rest you can salvage. So before you read this post, I have to tell you something interesting. I wrote this post last week and then decided to sit on it a bit. I wanted to read it again before I posted it with a fresh set of eyes. Flash forward to the following Sunday and our Pastor does a sermon on laziness. Coincidence, well I think its more God is working on me and maybe you reading this too. His sermon tied laziness into our spiritual lives, family, marriage and just everyday...not specifically work related. After you read my post, you'll see how it ties in even more to that. He talked about how we may be super hard working when it comes to our jobs, but still be lazy in our marriage or with our time with God. Anyways, I just had to share, because I feel that was more than just something that happens. So I challenge you to really think about when you are choosing not to do something, is it because you are too busy, or are you being lazy? Saving money isn't easy. Saving money takes work. It takes energy and time. Both aren't always easy to have and can seem limited most days. 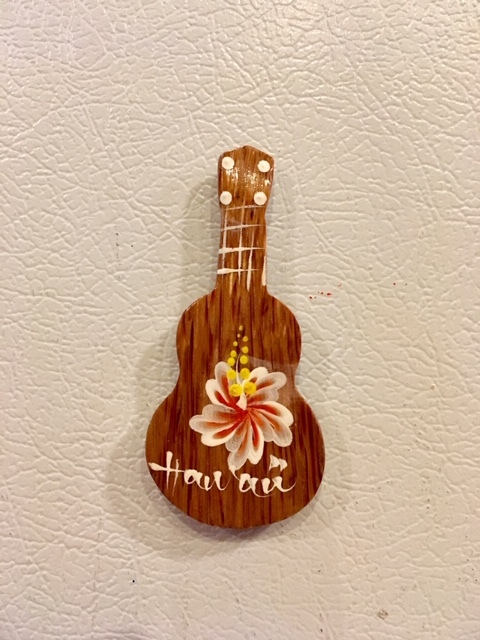 This post was inspired by a magnet that has been sitting on my island for a couple weeks. 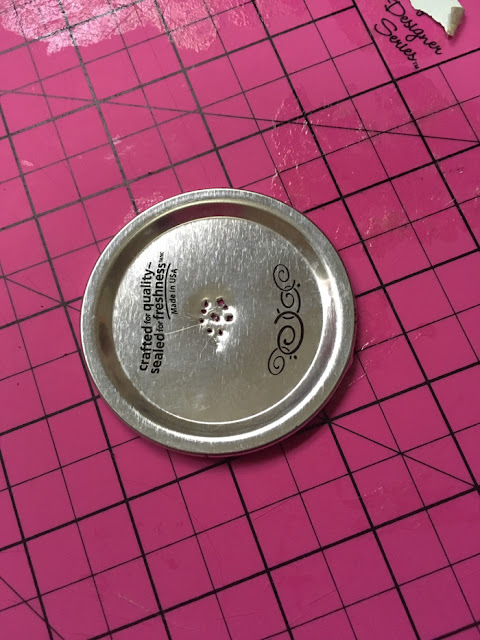 A simple magnet. It broke one day and at the time I knew it could be fixed. But, the longer it sat on my counter the harder it was to find time and energy to fix it. 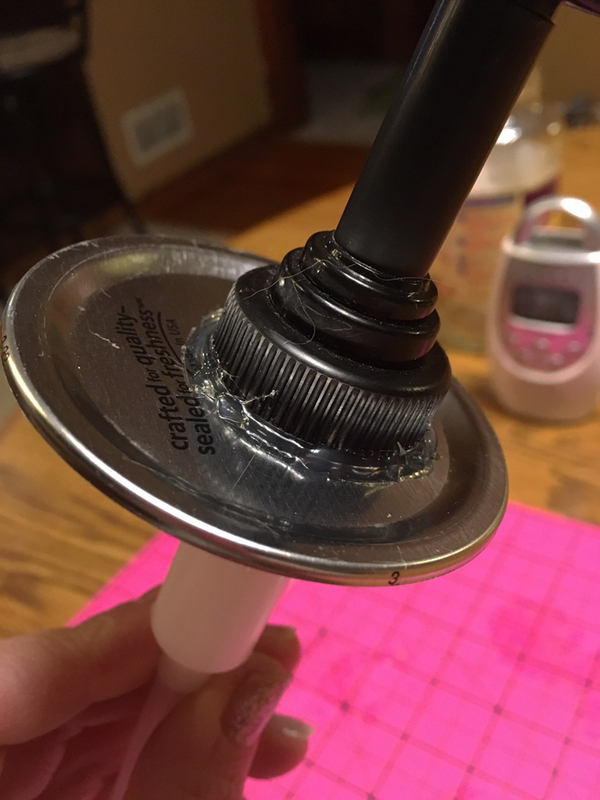 The longer it sat on my counter, made the simple fixing it seem much more complicated. How often does this happen when we are trying to save money. Oh I was going to make a home cooked meal tonight, but going through drive-thru was much faster and easier. I wish I could cut our water bill down, but I don't have time to hand wash the dishes. Don't get me wrong, I definitely have been there. There are many times I find I throw stuff or food away because I just am too busy to fix it or save it somehow for something else. And then that "too busy mentality" does turn into being lazy, because the said item sits forever and then when I do have time I've mentally made myself think it's going to take way longer. I mean it must, because if it didn't then I just would have done it in the first place right? So it must be something that's going to take a lot of time and energy so then I just become lazy and throw it away. Yep, even that magnet (that was a gift), had me thinking about throwing it away. Because that would be the easy way out. Then it's out of my sight and it's been handled. But really, instead of solving the problem, I just got rid of it. And I've found that I do this more often now, but am I lazy or am I just too busy? There have been times where I think to myself, "Man, I'm so much more lazy than my parents were". While, I'm sure there's some truth to that because I do feel each generation gets a little lazier. I also feel we are just becoming more busy than the generation before us. I mean how many of you feel that some days all you do is drive? Drive from one place to the other, for one activity to the next? We are just starting to get into that stage of life as our oldest has started dance after school once a week. Just that one thing that's once a week, has already made us crazy busy. And it's only one more thing added. But when you factor in, grocery shopping, cleaning house, making supper, teaching my littles, picking up oldest from school, 2 days at an after school program, 1 night of dance...the list could go on more, but you can see how just one more thing adds up. I feel our generation, or just generations in general lately are just adding that one more thing and then wondering why we are spending so much on food, or things. So while I don't have an exact answer, I think that it can be a combo of both. 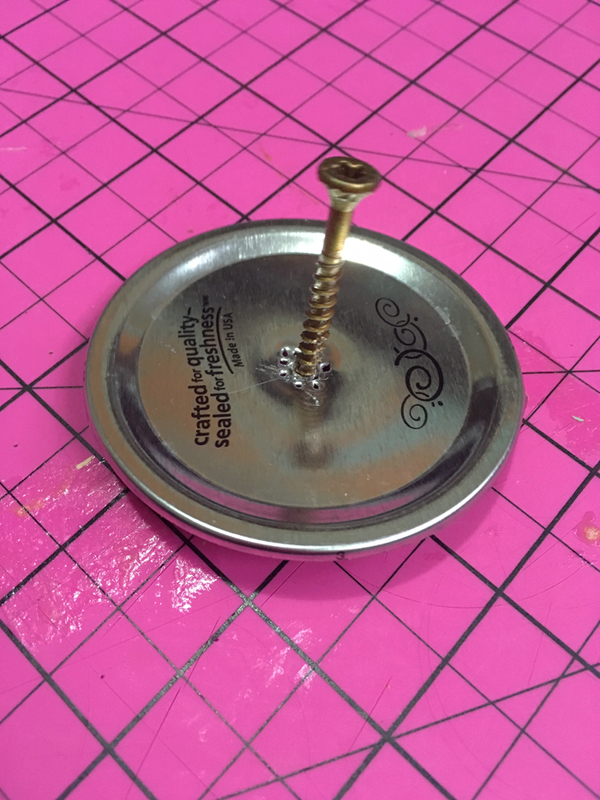 Today I sat down and glued that magnet back together. And you know what, it took me a total of 2 min. I'm not even joking, it was nothing out of my day to do. So in that sense, I'd say it came down to being lazy. When it first broke, if I would have just fixed it right away it'd have been done. But I didn't, I was lazy. Other things might be because I'm crazy busy. But, what I've found helps me is scheduling. Being organized is a huge help when saving money. Organized in your kitchen so you know what you have on hand and what you need to get for your menu that week or month. Organized in cleaning so you know if you missed cleaning the bathroom last week or not. Organized in your day, because if you have your day mapped out then you know when you have time to fix the little things, or to play with your kids or read? But not doing theses things is when I'm being lazy. I know that doing these small tasks will help me in the long run and will help my day go smoother. This is where saving money takes time and energy. It takes time to write out that grocery list after taking time to look through your pantry and taking time to plan a menu. It takes time and energy to keep your house clean, but it's something you do. So why not take some time and energy to plan ways to save money. I feel this post doesn't have an exact answer, but it definitely is something I've been contemplating. If anything, now each time I want to take the easy way out I can stop and think, could I have put a little more energy into this, or can I just take time to fix said item now? School year has started! 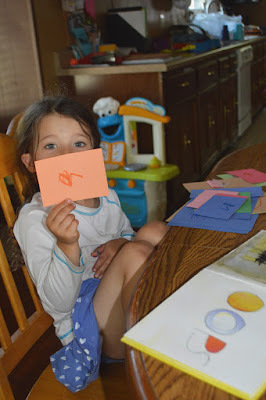 While I don't homeschool, I do some preschool teaching to my kiddos before they go to school. (You can see some of my other preschool posts at the bottom of the page.) With that, we use a lot of construction paper. 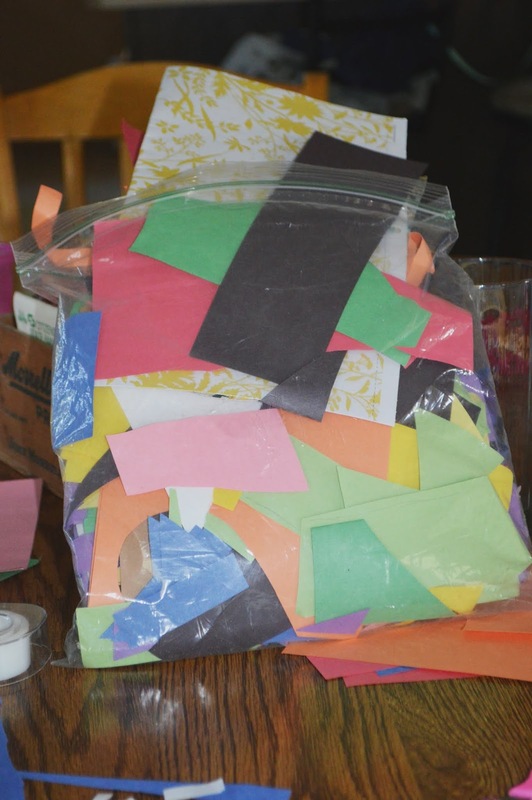 When I first started planning and making our projects to do, I realized how much construction paper we were going through, especially when there was a free day of crafting. So I slowly learned some ways to save on that construction paper. Have you ever seen a kid cut something out of a piece of construction paper? They always cut right in the middle leaving a lot of extra paper left over. This was such a waste to me and I wanted to do something to make sure we could use the construction paper to its full potential. One of the ways I've done this is by starting a scrap paper bag, any of the paper scraps that are left over from a craft we put in a designated ziplock bag. This way we have scraps for them to use for other crafts. This bag is my go to for when I need to cut out small little eyes, tails, or spots for our letter crafts. Another way we use this scrap paper bag is for gluing and cutting small pieces. When the girls were learning to cut I would give them the paper from the scrap paper bag and they could practice cutting it up. Also, when Peanut was going through a gluing phase she would take the pieces she cut and glue them to another piece of paper. This saved so much paper, because all she wanted to do was glue over and over and this paper was just paper that was extra. A second way I saved on construction paper was by giving them less. 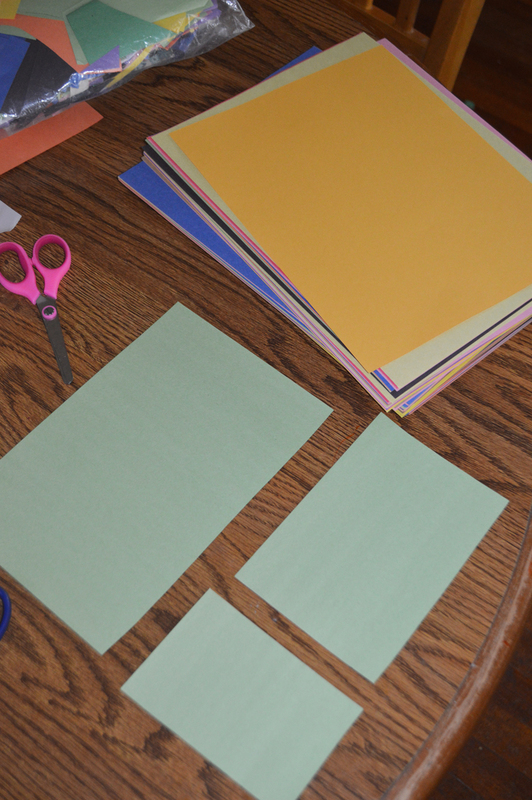 That construction paper is so large and as I said before kids don't do the best at cutting on the edge. So instead of letting them have the whole paper, I would first cut the paper in half. This worked great for when my oldest was going through a book phase. 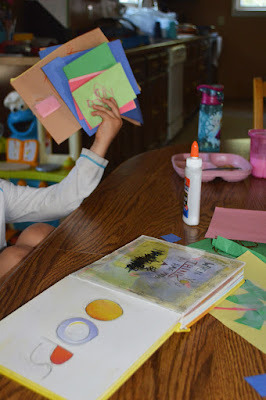 She loved taking books and then making them using construction paper. She took Brown Bear Brown Bear for instance and then figured out what color each page would be, brown for the bear, red for the bird, yellow for the duck, etc. I loved how she was learning to put things in order, recognize what color would be represented on each page and so forth, but one full-sized construction paper for a circle to represent the bear just seemed like a waste. So we cut the paper in half, it made it the perfect size for a book and she could be creative and re-make the books while I could be content that we weren't using to much paper. Some books we been cut the construction paper into fourths...make it go even further! My little soon to be kindergartener....wait where did the time go?! It's crazy to think that my oldest will be starting kindergarten this Fall. Or as she likes to say in 8 days! 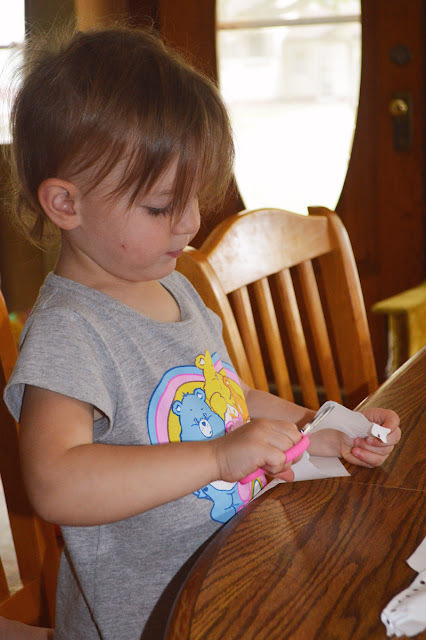 Well anyways, since she started learning to write her letters she has loved to make lists, or write out people's names or just write down letters and try to make words. Now that Peanut is starting to write too (seriously, they are growing so fast), we go through even more paper. But, learning to write is HUGE. I want my girls to be able to write and being able to learn to write on paper is a privilege, really it is. So I don't want them to be wasting paper and I want them to see the value of using the paper that we have because it's a privilege to have it. I don't know about you, but my girls love notebooks. They get it from me I think, there's just something about having a notebook to jot down your thoughts, feelings, ideas etc. I have multiple notebooks. I'm crazy and like to have a different notebook for each subject area of my life. Well, my girls love notebooks too. My oldest is always asking for a notebook to jot things down in or have for her stickers, yep she has a separate one just for stickers, she definitely takes after me. So two things; first of all right now it's Back to School time and all those notebooks are on sale, whoot whoot!! That's the best time to buy any of those school supplies that you need to stock up on throughout the year. You can check out my Savings on office/school supplies here for more tips on that. Secondly, how many of you use a notebook ALL THE WAY THROUGH? Be honest, how many times do you have a notebook that you used for awhile for said event and then the rest is just left? We have lots of notebooks, my husband kept ones from college and high school...yes high school! But, going back to teaching out kids not to be wasteful we have that paper instead of just throwing it out. We also use those notebooks in two different ways. 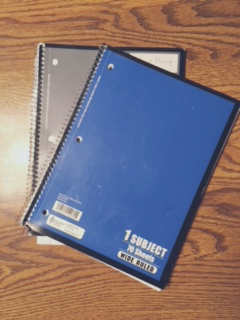 First we use them as spare paper, instead of buying loose leaf paper, we just use the extra out of the notebooks. That way we are using what we have and not spending more money for one and not taking for granted what we have for another. But the biggest way we reuse them is to let the girls have their own notebook. They love this! They feel so adult having a notebook that they can write in. Sometimes they use it to write names, other times to try to spell words, other times they get it out before we go shopping so they can make their grocery list too. I mean the possibilities are endless and we are reusing something that might not have been used. Plus they are learning too, I mean they are practicing writing their letters and writing without the sit down and practice. This is something they enjoy doing and as a mom we are always looking for ways to help them learn as they play right? So next time you have a notebook that you're done with see if your little preschooler/elementary kiddo would like to have it. You'll be amazed at what they come up with to use it for.